Wanting to treat someone special to some well-deserved time out from the hustle & bustle? 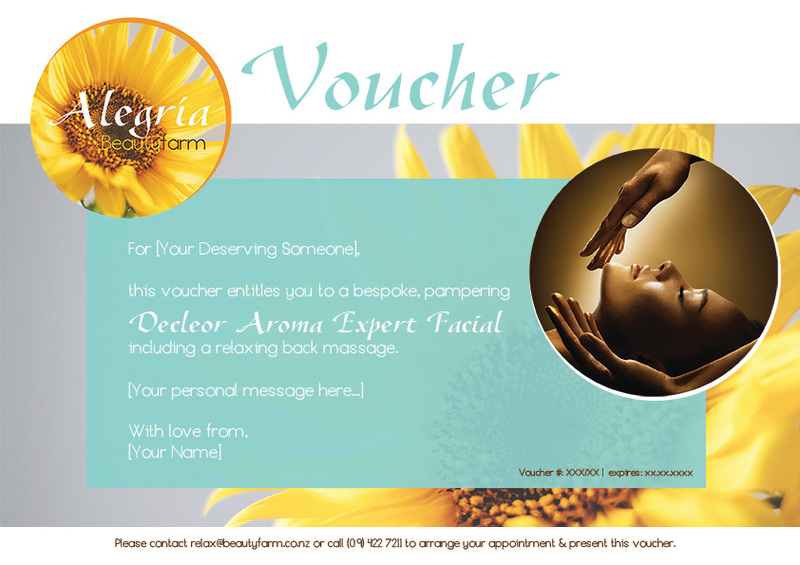 Alegria vouchers are beautifully designed and personalised for the recipient. If you wish, we can also include a brief personal message from you. You can either choose to purchase a voucher for a specific treatment or package, or a voucher for a dollar value. This can be used towards any treatment/package from our menu, of the recipient’s choice. We can either print the voucher for you to pick up, or alternatively send it to you digitally, as a PDF or jpeg file for you to print out. Our vouchers are valid for 6 months. To keep it fair for both parties we would appreciate, if the voucher is used within this time. Please note, our vouchers are non-refundable or redeemable for cash, or to be used for purchasing products. For the valuable gift of “time out”, or some R&R for someone you love, please contact us to order your gift voucher.